High-school freshman Ahmed Mohamed was arrested Monday for bringing a clock he built to school after it was mistaken for a bomb. Scientists, engineers and tech organizations have responded en masse with their support. 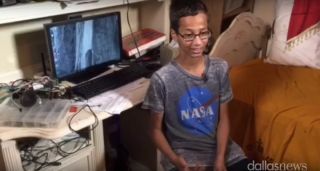 NASA, Obama, MIT and more hailed teenaged Ahmed Mohamed, who was arrested at school Monday when teachers mistook his homemade electronic clock for a bomb. Social media quickly picked up the Texas teen's cause with the marker #IStandWithAhmed, garnering offers to visit NASA's Jet Propulsion Lab, MIT, Google and the White House, a scholarship to Space Camp, and even am astronaut's NASA shirt that's flown in space (to complement the one he was wearing during his arrest). NASA reaffirmed their support of science, technology, engineering and math (STEM) curriculums, saying they hope to inspire kids like Ahmed. Bobak Ferdowski, NASA's 'Mohawk Guy' systems engineer at JPL who worked on landing the Curiosity Mars rover, offered his support, saying he might not have worked at NASA at all if he'd faced a similar situation. President Obama offered his encouragement, as well. Those invitations were joined by a few more: visits to MIT, Facebook and Google, to name a few (and an offer from R&B singer Ne-Yo), as well as an offer for a Twitter internship. It looks like he'll take up at least one of those invites. As a NASA fan, Mohamed has been offered a scholarship to space camp as well — from Homer Hickam, former NASA engineer and author of "Rocket Boys," which became the movie "October Sky." In 2013, Hickam offered such a scholarship to Kiera Wilmot, a high school student arrested after a science experiment done on school grounds exploded. Canadian astronaut and space popularizer Chris Hadfield, known for his videos filmed in space, sent along an invitation to his science show in Toronto. Email Sarah Lewin at slewin@space.com or follow her @SarahExplains. Follow us @Spacedotcom, Facebook and Google+. Original article on Space.com.